Greg Fredericks has been practicing Naturopathic Medicine since receiving a doctorate degree in 1987. He has learned from some of the world’s leading biologists and scientists to develop his unique approach to Naturopathic medicine. Greg believes people can be empowered to take control of their own health and longevity and reverse many disease conditions if they are given the Proper Blueprint. Greg Fredericks received his Bachelor Degree with honors from the University of New Brunswick, CA 1976 after enrolling in Pre-medical studies. In 1984 he received a Masters Degree in Psychology from the University of St Louis, USA and Doctorate degrees in Naturopathy (1987 & 1996). Greg became an educator/formulator for Biotec Corp and Aveda Aromatherapy in Calgary, CA from 1987-1993 and later received a Diploma in Nutrition and Natural Health in 1995 from Bastyr College and subsequent Diplomas in TCM from the Chinese Herbal Institute in San Jose, CA (1997). Greg is also a graduate of the WA School of Pathology (1998). Greg was fortunate to train with some outstanding practitioners in the 1980’s and 90’s including Gaston Naessens, Bernard Jensen, Dr. med. Maria M. Bleker and others. He has multiple certifications in Blood Analysis from various disciplines around the world. He has lectured internationally on behalf of Sanum-Kehlbeck GmbH & Co. Germany from 1997-2001. Greg has been the Director of Nu-Look Biologics since 1997. His articles have appeared in Explore for the Professional (USA), Nexus and Sanum (AUS). He is an Executive Board member and NSW State Representative for the Complementary Medicine Association of Australia (CMA-2017-2019) and is a member of the American Naturopathic Medical Association. He has recently completed a 12 month intensive course entitled Integrative Oncology in Practice. 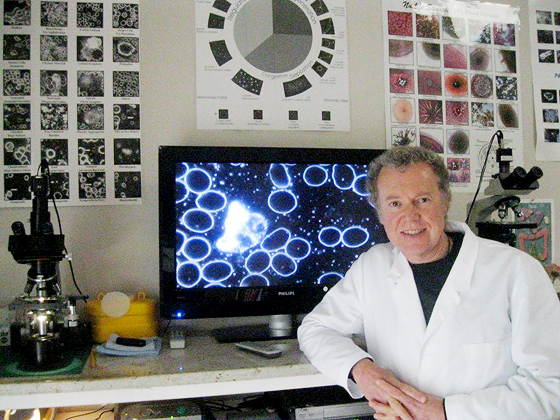 Greg is an author and international lecturer in Darkfield microscopy and Naturopathic Medicine and in over 32 years of practice has performed over 70,000 consultations.